'Binders,' cooking and equal pay: Did Romney undo gains with women voters? 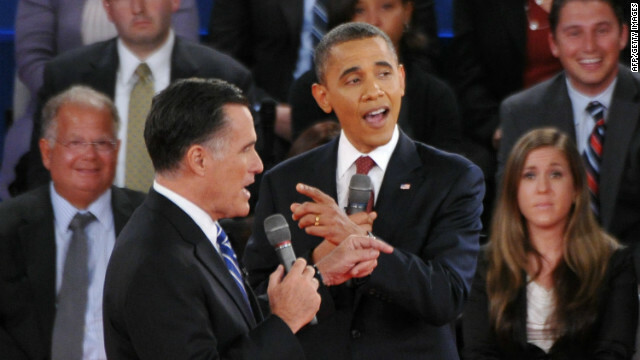 Washington (CNN) -- Before Tuesday night's debate, polls showed Mitt Romney had gained ground with women voters. But his comments about using "whole binders full of women" as a hiring aid while governor, whiffing on an equal pay law question, and alluding to helping women get home to cook dinner has landed the GOP presidential hopeful in verbal quicksand with some female voters. He'll have to do some serious repair to regain traction, political experts say. Romney talks about 'binders full of women"
That's because Tuesday night's debate made clear that both presidential campaigns are focusing on female voters — a group that makes up the majority of the electorate. 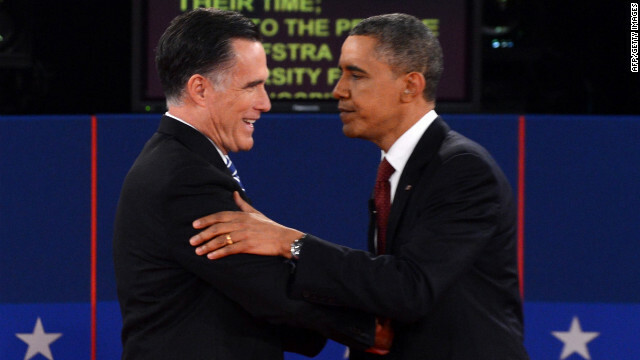 Republican presidential candidate Mitt Romney and U.S. President Barack Obama shake hands following the second presidential debate at Hofstra University in Hempstead, New York, on Tuesday, October 16, moderated by CNN's Candy Crowley. 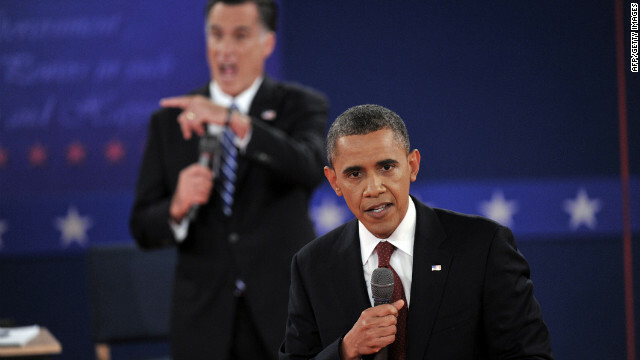 See the best photos of the first presidential debate. President Obama and first lady Michelle Obama embrace after the debate. 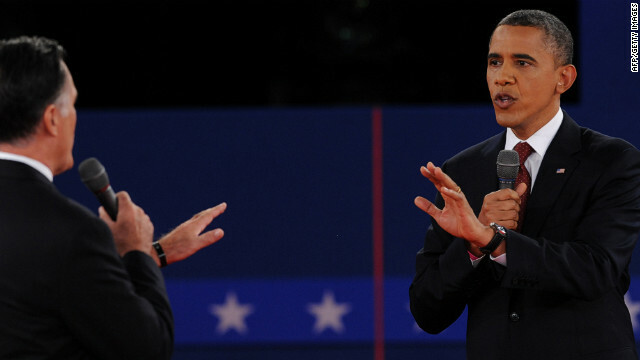 U.S. President Barack Obama and Republican presidential candidate Mitt Romney point fingers at each other. 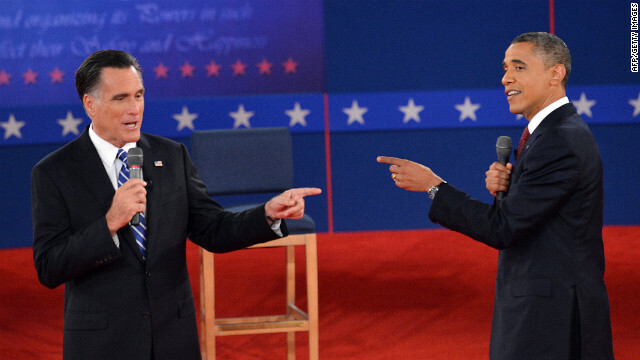 U.S. President Barack Obama and Republican presidential candidate Mitt Romney speak over each other. 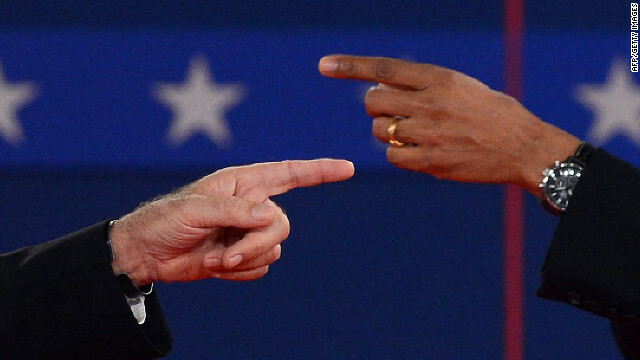 President Obama and Republican presidential nominee Romney point the finger at each other. 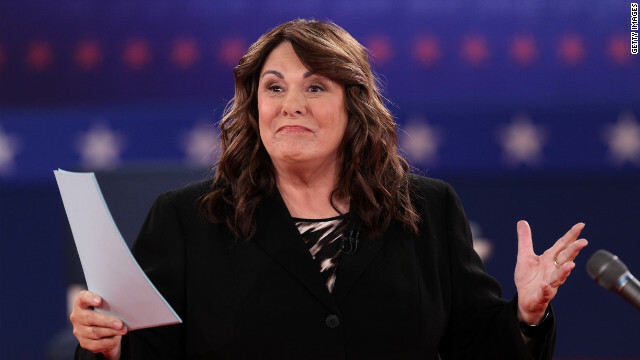 CNN's Candy Crowley moderates the second presidential debate between President Obama and Republican presidential candidate Mitt Romney. 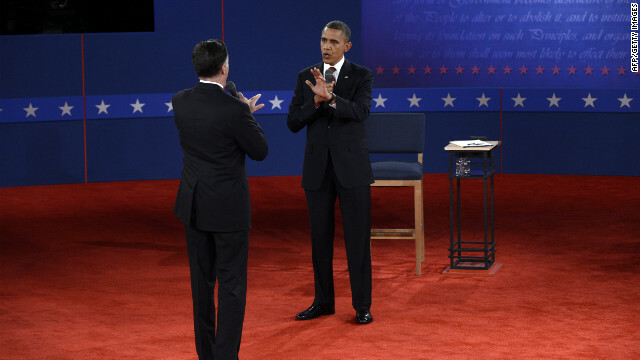 President Obama and Romney clash during the debate. 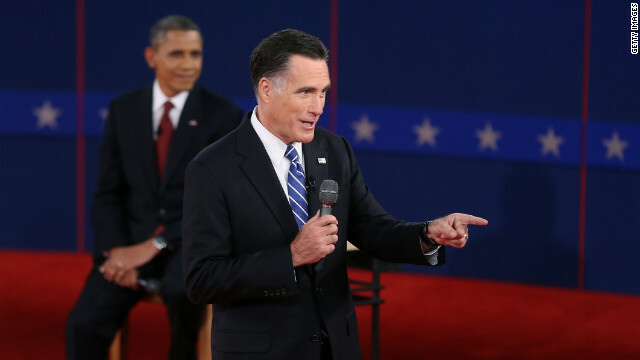 Romney and President Obama interrupt each other during the debate. 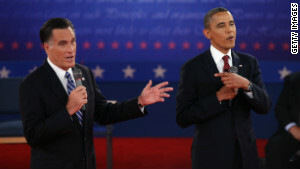 Republican presidential nominee Mitt Romney and U.S. President Barack Obama debate. 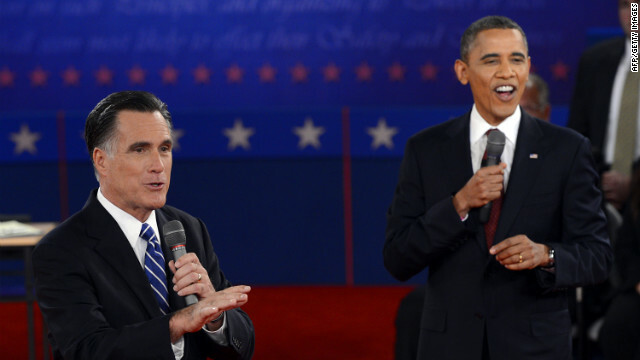 U.S. President Barack Obama and Republican presidential candidate Mitt Romney both speak at the same time. 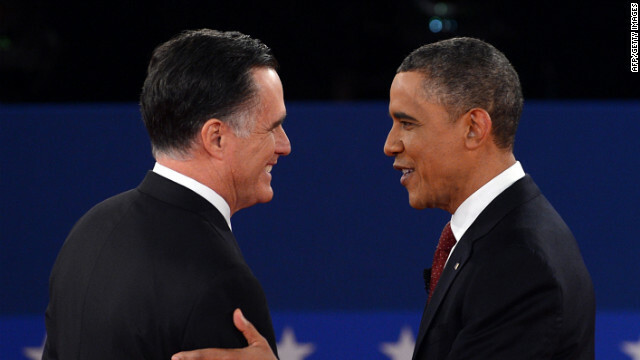 Republican presidential nominee Mitt Romney and President Obama go head to head. 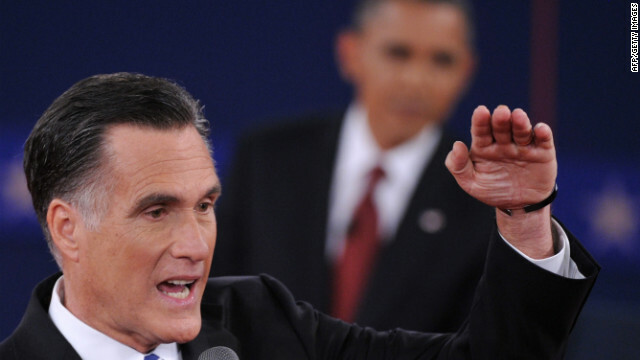 Romney gestures to make a point as President Obama looks on. 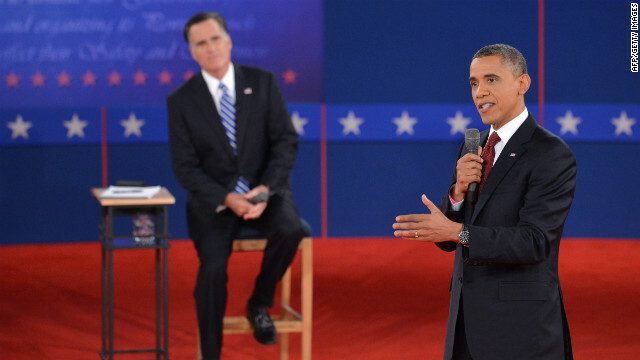 U.S. President Barack Obama and Republican presidential candidate Mitt Romney square off. 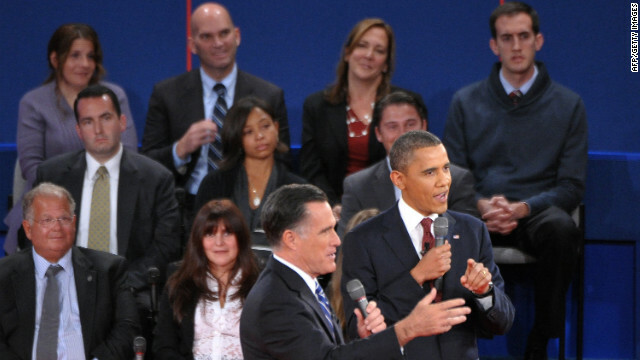 U.S. President Barack Obama listens to Republican presidential candidate Mitt Romney. 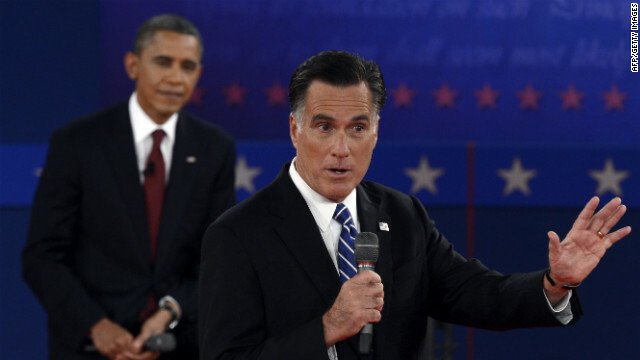 President Obama promotes his policies as Mitt Romney listens. Republican presidential candidate Mitt Romney addresses a question as President Obama listens. 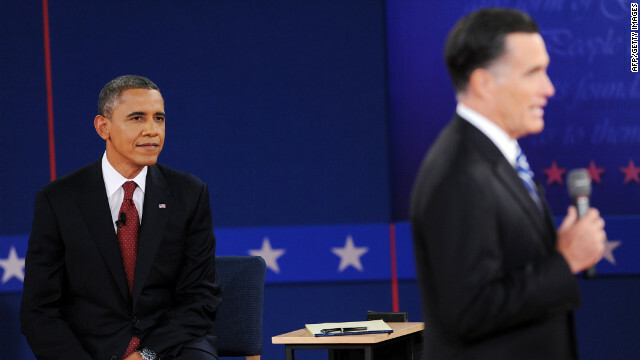 President Obama awaits his turn to speak. 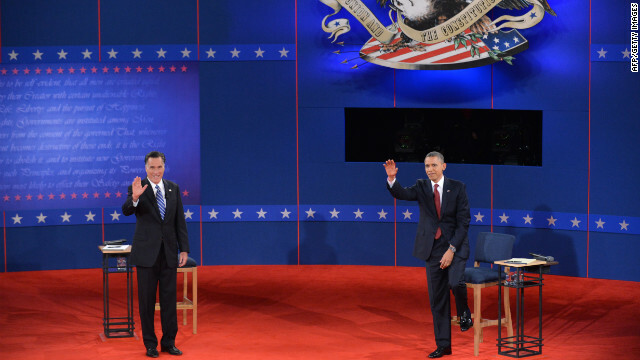 U.S. President Barack Obama and Republican presidential nominee Mitt Romney greet the audience. 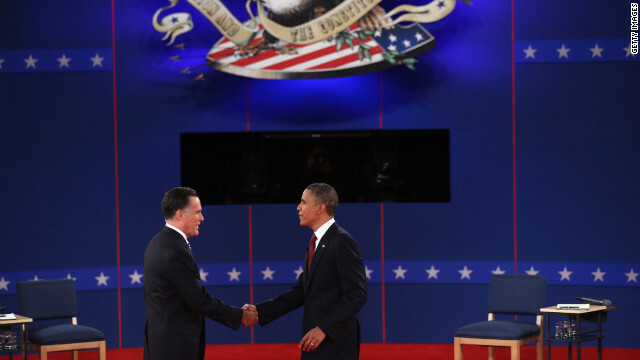 Republican presidential candidate Mitt Romney and U.S. President Barack Obama greet each other on stage. 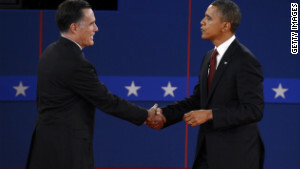 U.S. President Barack Obama and Republican presidential nominee Mitt Romney shake hands.6. 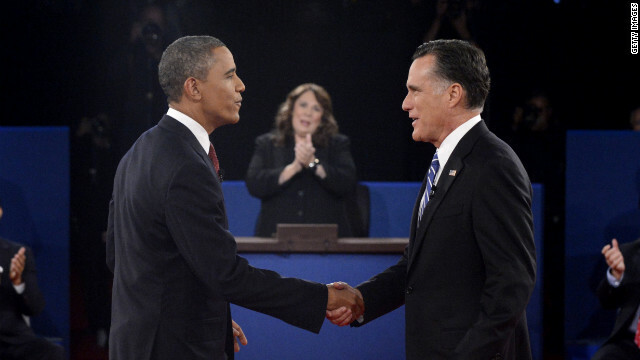 President Obama and Republican presidential candidate Romney shake hands before the start of the debate. Moderator Candy Crowley of CNN speaks to the audience prior to the start of a town hall-style presidential debate. Ann Romney, wife of Republican presidential candidate Mitt Romney, speaks with members of the audience before the start of the second presidential debate at Hofstra University in Hempstead, New York, on Tuesday, October 16. 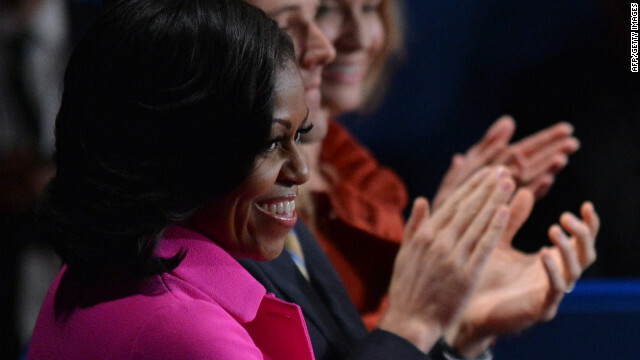 First lady Michelle Obama awaits the start of the second presidential debate. Republican presidential candidate Mitt Romney and his wife Ann await the start of the second presidential debate in a holding room. 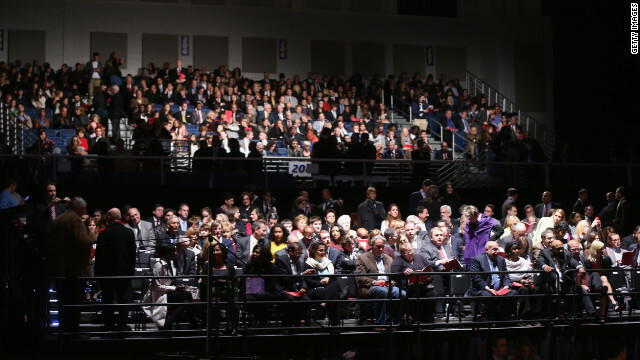 The audience gathers in the stands prior to the start of the presidential debate on Tuesday. 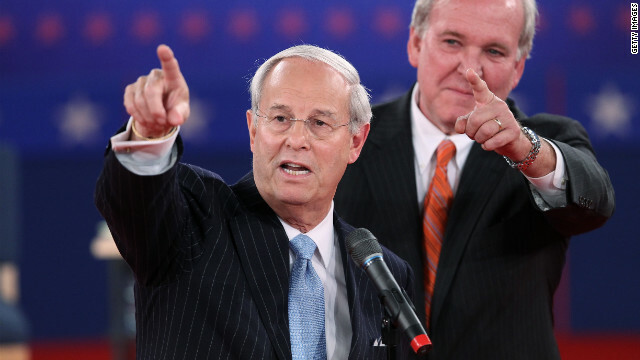 Co-chairs Frank Fahrenkopf, left, and Mike McCurry of the Commission on Presidential Debates speak in the lead up to the town hall-style debate. 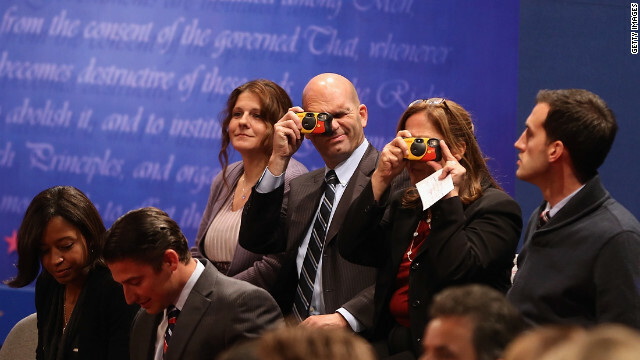 Audience members take photographs while they wait for the debate to begin. Members of the audience have taken their seats. 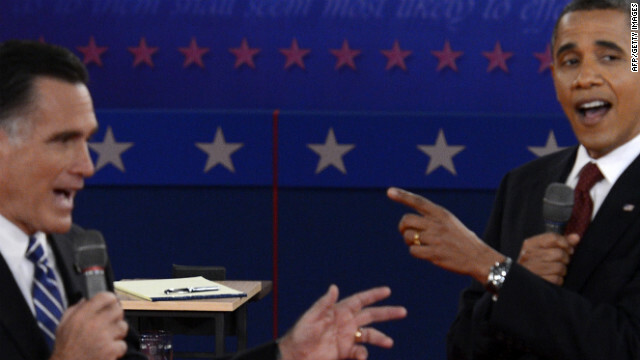 Some of the spiciest exchanges between the candidates in their second debate were over so-called "women's issues." "Romney's discussion of his promotion of women in his gubernatorial administration was ... problematic," said Andra Gillespie, an associate professor of political science at Emory University in Atlanta. "First, Romney's description of how he found female appointees sounded an awful lot like affirmative action, and someone will bring this up again. Also, the Twitterverse exploded with links to articles about how Bain Capital under Romney's leadership didn't have a female partner." The highest-ranking woman in his gubernatorial administration was his No. 2, Lieutenant Gov. Kerry Healey. 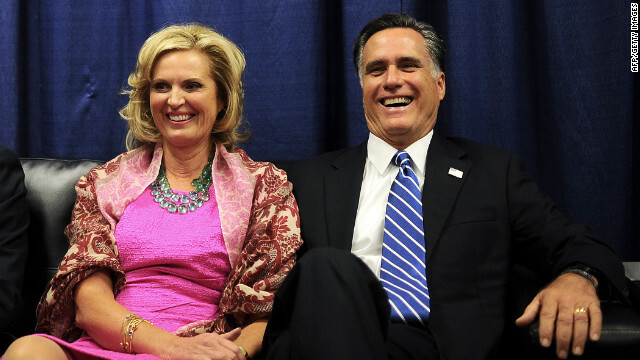 Beth Myers has long held senior positions in Romney's political campaign. President Barack Obama was quick to use the "binders" line against Romney on the campaign trail Wednesday. "We don't have to collect a bunch of binders to find qualified, talented, driven young women ready to learn and teach in these fields right now," Obama told supporters in Mount Vernon, Iowa. Vice President Joe Biden at a campaign event Wednesday in Greeley, Colorado, questioned where Romney's comments were coming from. "What I can't understand is how he has gotten in this sort of 1950s time warp in terms of women," he said. Romney responded on Twitter: @MittRomney "I understand the challenges women face and want to make it easier for them in the workplace." During the debate at Hofstra University in New York, Romney, who worked in business before serving as governor of Massachusetts, said he "learned a great deal" about the inequalities between men and women in the workplace when leading his state. When he and his staff ran into problems finding qualified female applicants to fill cabinet posts, Romney said he "went to a number of women's groups and said, 'Can you help us find folks,' and they brought us whole binders full of women." Undecided women voters who were watching the debate and participating in a focus group in Ohio reacted positively to Romney's anecdote during dial-testing for CNN. The responses from the women jumped sharply on-screen when Romney spoke about workplace flexibility. The tweets, posts and pictures quickly exploded on the internet. Before the debate ended, there were Twitter hashtags and handles, a series of memes on Tumblr, and a Facebook page with over 100,000 fans. The "binders full of women" phrase was the third-fastest rising search on Google during the debate. Not to be outdone or out-messaged, the Romney campaign put out an ad as the debate wrapped up, clarifying the GOP nominee's support for contraception and belief that in some cases abortion should be legal. But there is a lingering perception behind the comedic Internet takes on Romney's "binders full of women" response and pre-emptive advertising aimed at women that he is disconnected from the day-to-day issues facing that critical group of voters. And in a close election, that type of narrative could be a problem for Romney as he fights to woo a narrow pool of voters. "The gap between Obama and Romney was declining and I'm not sure ... if the governor made significant headway (with women voters)," said Meena Bose, director of the Peter S. Kalikow Center for the Study of the American Presidency at Hofstra. A USA Today/Gallup poll conducted last week showed Romney had closed the gap with women and was within one point among women who are likely voters, 48% for Romney and 49% for Obama. 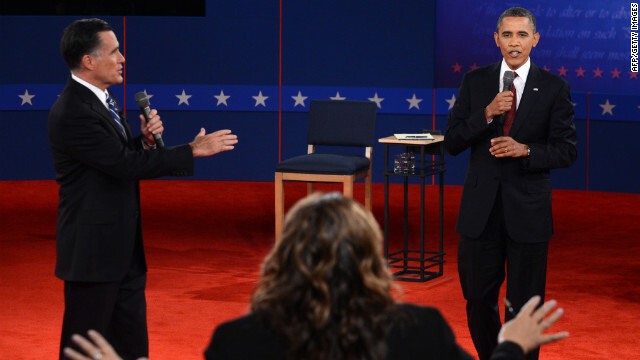 Throughout the debate, Obama and Democrats sought to reverse that trend and widen that gap. Obama tried to draw a distinction between himself and Romney on a number of women's issues, tying equal pay, contraceptives and health care to the economy. Obama said his administration's Affordable Care Act gives insured women free contraception coverage and asserted that Romney "feels comfortable having politicians in Washington decide the health care choices that women are making." Romney pushed back, calling the president's statement "completely and totally wrong." While not opposing the availability of contraception, Romney opposes the contraception rule, arguing it forces some religious institutions to go against their faith. 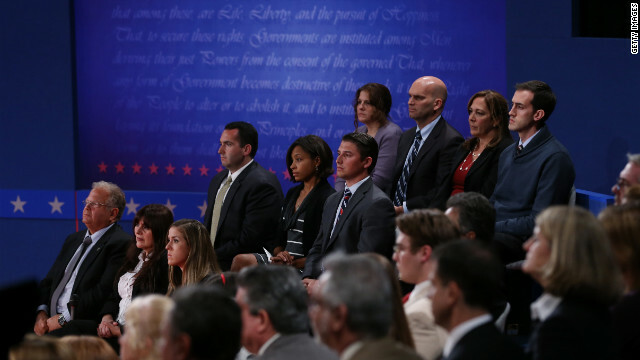 After the debate, Democratic pundits criticized Romney's efforts to hire women. 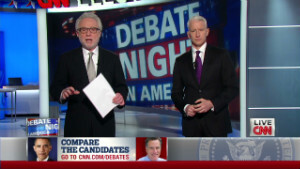 "What it demonstrates here and why these debates are important because they're a window into what people are really thinking and how they operate," former Clinton adviser and Democratic analyst Richard Socarides said on CNN's Early Start. "Here's a situation where, you know, it should have been readily apparent to anyone that there were plenty of qualified women but they had to make this special effort." Socarides gave Romney points for trying to hire women but said in doing so, "Romney demonstrates that he's living in another world." "Qualified women should be apparent to everyone," added Socarides. He said he didn't understand why Romney "has to go out and make this special effort to find women." And though Romney sought to highlight his support of flexible work schedules for women, his reference to women who need such schedules to race home to make dinner for their families may have ruffled some female voters the wrong way. "His discussion of work-life balance appeared condescending to some because of the reference to women cooking dinner," Gillespie said. Romney will now have to rebuff the Obama campaign's attempts to define him as someone who is anti-woman, political experts say. Romney campaign surrogate Rep. Marsha Blackburn, R-Tennessee, said one reason more women may be looking to vote for Romney is because of his economic message. "The Number One issue with women is jobs and the economy," Blackburn said on CNN's Early Start recently. The former governor will have to do more of this type of messaging if he wants to sway this group, Bose said. Romney, she said, will have to hammer home the message "what's good for women is good for the country." CNN's wire staff, political unit and Emily Smith contributed.